This fall, ICWA is doodling its way across the Middle East. Fellow Jonathan Guyer recently participated in Le Festival International de la Bande Dessinée d’Alger, the region’s premier comic con. Speaking on a plenary session entitled “Dis le mois en bulles: La Bande Dessinée et le Dessin dans le monde arabe,” he joined Algerian cartoonists Le Hic and L’Andalou and broadcast journalist Ahmed Lahri for a wide-ranging discussion about freedom of expression in the Arab World. 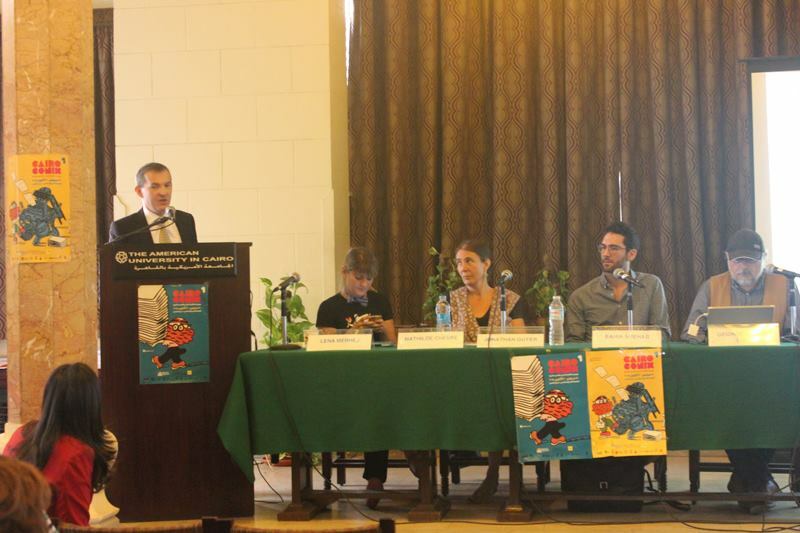 In October, Jonathan participated in the CairoComix Festival, where he served on the jury for the festival’s six awards, moderated a panel in Arabic on identity politics, and presented a paper based on his research. You can read more about CairoComix in his article for the Egyptian news and culture platform Mada Masr. In November, he will speak at the Symposium on Comics in the Arab World at the American University of Beirut. As Jonathan likes to say: Stay ‘tooned.